This American Heart Association CPR class is the Required CPR for all school healthcare and medical related programs. Nursing, Dental, Medical, EMT, Therapists, etc. Renew your ACLS provider card in this Stress Free, fun and relaxed Advanced Cardiac Life Support Class. Our friendly instructors focus on your success! Register now to renew your 2 year PALS provider card. Local American Heart Association Pediatric Advanced Life Support class in Cincinnati. 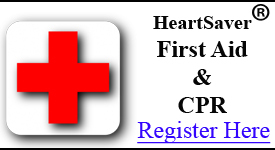 Register now for this American Heart Association HeartSaver First Aid and HeartSaver CPR class with AED Training. 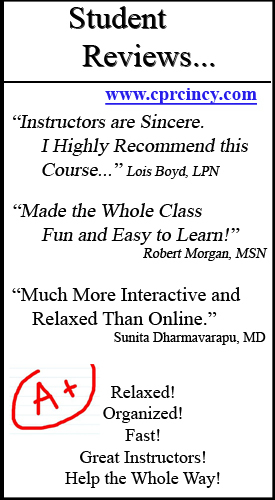 You will receive a 2 year AHA Certification after the completion of the course. 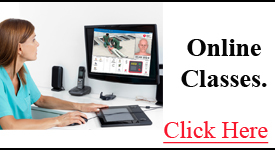 Complete Online Certifications with a Skills Session through the American Heart Association. 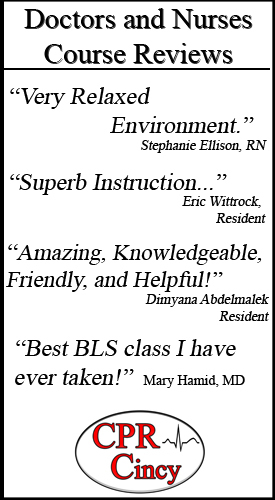 BLS for Healthcare Providers, ACLS, PALS, and CPR/First Aid Skills Sessions. Renew your 2 year American Heart Association BLS for Healthcare Provider Card. Classes are hands-on, organized and fast! Receive Your Card Same Day. 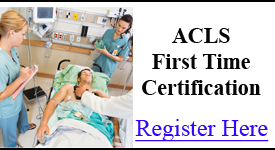 Get ACLS Certified in ONE DAY! Register now for this All Inclusive package where you will become certified in Advanced Cardiac Life Support. American Heart Association ACLS class. Register now for this All Inclusive package where you will become certified in Pediatric Advanced Life Support. American Heart Association PALS class. 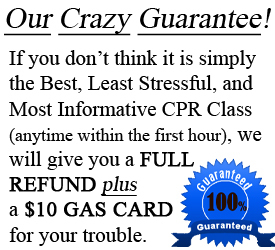 This CPR Class is for those without a medical background. This American Heart Association CPR class is designed for Personal Trainers, Lifeguards, Daycare Centers, Teachers, Coaches, Businesses, New Moms, Babysitters, etc. Register for an American Heart Association Online Class with Skills Checks Included at Our Local Cincinnati site. 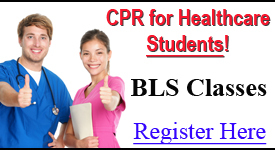 Classes include BLS for Healthcare Providers, ACLS and PALS. Schedule for one of our certified AHA instructors to bring everything to your office or group. HeartSaver CPR, BLS, ACLS and PALS certifications available. Most Commonly Asked Questions Answered. 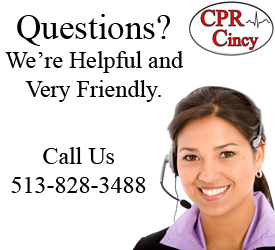 Q: Is CPR Cincinnati an American Heart Association training site? A: Yes! We are 100% certified to offer all AHA classes and provide each successful student with a 2 year American Heart Association wallet card certificate. *CAUTION: Beware of online companies that provide CPR, BLS, ACLS and PALS cards entirely online. The American Heart Association DOES NOT approve any course that is completed entirely online. At the very least, everyone must perform an in-person skills check by an approved AHA training site. Q: How can I register for a class? A: Signing up for a course is easy! You can simply use our course calendar to see all of our courses offered. If you click on the link within the calendar, it will take you to a secure registration page. At this time you can also add a required manual if you do not have one. 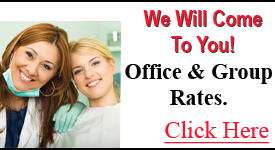 In addition, you may also call us and we would be happy to get you registered for the course of your choice. We are always here to help! Q: Is it required to have an AHA manual for class? A: Yes, as per the American Heart Association, all students must have access to the required course manual. These manuals can be purchased from us at checkout, or anyplace online where these manuals are sold. A: Basic Life Support for Healthcare Providers. We offer both 1st time certifications for those who have never held a provider card, as well as recertifications for individuals who have taken the course before. This is a CPR Class for Healthcare Providers such as nurses, doctors, dentists, dental hygienists, radiologists, paramedics, therapists, and all other healthcare and medically related professions. This course is also known as BCLS or Basic Cardiac Life Support, and it is the required course for healthcare providers. This is the certification that is required for school programs such as nursing school, physical and occupational therapy programs, dental hygienists, dental school, etc. This Healthcare Provider CPR Class Satisfies All Requirements for Healthcare Workers and Students in Healthcare and Medically Related Programs. 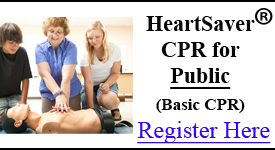 This course is American Heart Association certified and includes infant, child and adult CPR and AED training. At the end of the class you will receive a 2 Year AHA BLS Provider Card. 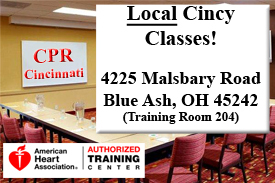 Register Now for the Best CPR Training Cincinnati has to offer! Advanced Cardiac Life Support (ACLS) ACLS is an advanced American Heart Association course for specialized health care providers such as surgeons, emergency medical physicians and nurses, paramedics, respiratory therapists, and other medical professionals who must perform in life threatening and critical situations. 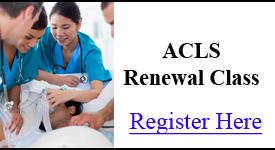 The ACLS renewal course averages around six hours to complete and culminates in the successful student receiving a 2 year ACLS provider card immediately after class. For those who have never been certified our ONE-DAY ACLS class is an ideal choice over the usual 2 day course offered at most training sites. Mastering knowledge and exhibiting skills such as managing airways, initiating IV’s, reading ECG’s, and understanding emergency pharmacology is required for course success. 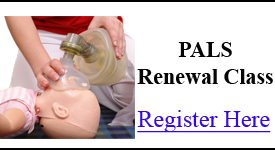 Pediatric Advanced Life Support (PALS) PALS is an advanced life support course revolving around a pediatric crisis. 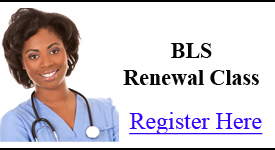 Just as with ACLS registrants can take the renewal or ONE-DAY 1st time certification course. 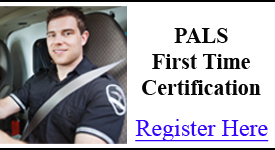 Specialized nurses, physicians, paramedics, and all other healthcare providers who must develop and enhance their pediatric assessment skills need to be PALS certified. You will learn and practice identifying the onset of shock, as well as respiratory and cardiovascular emergencies in children and infants. Q: Are all your classes for people with medical or healthcare backgrounds? A: No. We offer HeartSaver CPR and HeartSaver First Aid classes for the public. 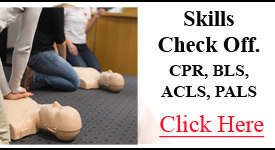 This would include those who are not in any medically related profession such as teachers, coaches, parents, grandparents, baby sitters, lifeguards, restaurants, airlines, and other corporate groups who are interested in having employees trained in CPR, First Aid and AED procedures. Q: Are all of your classes held at your training site or do you travel to surrounding areas as well? A: Yes, we will come to your office or group to provide full service for all of our classes. Our certified American Heart Association instructors will bring everything right to you. Contact us for more information. Q: In which areas do you provide classes? A: We provide service to the Cincinnati-Middletown−Wilmington area including Hamilton, Butler, Warren, Clermont, and Brown, as well as the Kentucky counties of Boone, Bracken, Campbell, Gallatin, Grant, Kenton, and Pendleton, and the Indiana counties of Dearborn, Franklin, and Ohio.